Fire Restaurant and Lounge offers the best casual and private dining experiences in Dublin. Fire is consistently voted as on of the best restaurants due to the mix of welcoming hospitality, award winning decor, late night cocktail and wine bar and our award winning succulent Irish Hereford Prime Irish Steaks! At FIRE we offer a wide choice of menus including Table D'Hote. A La Carte as well as Early Bird and Pre Theatre dinner menu options and new to Fire is our Cocktail and Whiskey Master Classes. Plus every Sunday we host Ireland's best family friendly Sunday roast experience, available from 1pm - 9pm. 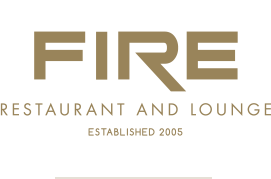 Fire Restaurant and Lounge is ideally situated in Dublin City Centre with car parking, a taxi rank and easily accessible by all public transport links including the Luas. Fire may just have the most impressive dining room in the City Centre. Paolo Tullio. Taste of Ireland. Contact us today for more information on the best conference and meeting rooms Dublin has to offer.